November Number Line Center is a fun Thanksgiving themed activity where students Gr.k-2 use a number line to order various pumpkin and Pilgrim hat numbers! 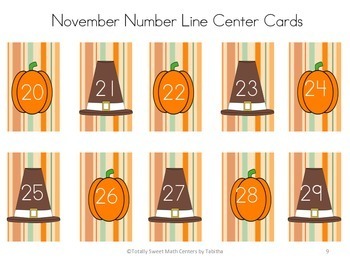 -As a group, draw one card, and place it on the number line with a clothespin. -Draw a total of nine more numbers, talking about where each should be on the number line. You will not use all of the numbers in the bag! Numbers that are close together, like 23 and 27, should be physically closer to one another. Numbers that are far apart, like 17 and 87, should not be close to one another on the number line. You may move the numbers on the number line as needed. 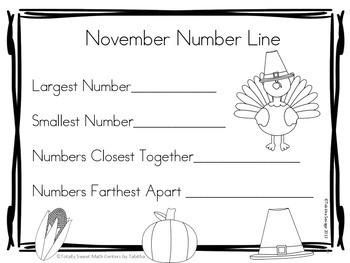 -Complete the question sheet about your number line with a dry erase marker. -Put all of the numbers back in the bag. Play again until time runs out. 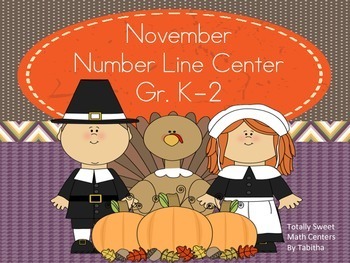 Looking for other Number Line Resources?